The Bayou Classic Cast Iron Oval Fryer is not only a fryer. 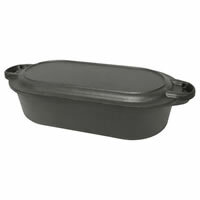 The Bayou Classic Cast Iron Oval Fryer is also a great cast iron roaster and the lid is a cast iron griddle. The Bayou Classic Cast Iron Oval Fryer is perfect for roasts and poultry, not to mention savory gumbos and stews. This cast iron oval roaster measures 6 quarts and has great distribution of heat. No matter what you are cooking, your feast will turn out juicy and cooked to perfection.